Admiration is the proper reaction to Chuck Adams, a man whose accomplishments in archery and bowhunting are legendary. Adams again entered rarified space that only names like Fred Bear, James Dougherty and Dwight Schuh can occupy. Space filled by sportsmen who are archers, bowhunters, champions of their sport and prolific journalists. Adams was honored by the Professional Outdoor Media Association (POMA) and Archery Trade Association (ATA) as the recipient of the prestigious POMA/ATA Fred Bear Archery and Bowhunting Communicator Award. 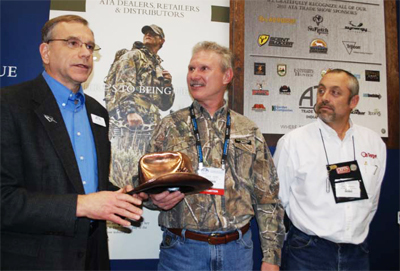 The presentation took place during the ATA Trade Show in Indianapolis, Ind. “Bowhunting journalism was not a career Adams sought,” explained POMA Board Member Bob Humphrey during the presentation. “Rather, it was a career that sought him. Through a professional journalism career spanning more than two decades, and an even longer personal bowhunting career, he has distinguished himself as being among the elite in both. Adams is arguably the most accomplished bowhunter in the world. He is the first bowhunter to have taken all of the North American big game species recognized by the Pope & Young Club (the “Super Slam”), and has more official P&Y entries than any other bowhunter in history. These animals include former and current world records for Yellowstone elk and mountain caribou, along with others ranking in the top 10 in the all-time records. He’s taught millions of archery and bowhunting enthusiasts through thousands of magazine articles and seminars at outdoor expositions. On January 4, 1990, Chuck Adams became the first archer to complete the fabled super slam – harvesting all North American big-game species with a bow. His name appears more times than any other hunter in the Pope and Young record book, with more than 100. His first book, Super Slam! : Adventures with North American Big Game published in 2008, retraces Adams’ epic journey to take all North American big-game species with a bow. He is a member of the Bowhunters Hall of Fame and Safari Club International Bowhunters Hall of Honor and his name is on the Pope and Young Ishi Award. Gregg Gutshow, author of Adams’ biography Life at Full Draw: The Chuck Adams Story (www.ihuntbooks.com), knows Adams like few others. “We as bowhunters and the bowhunting industry are extremely fortunate to have had Chuck Adams as a bowhunting partner,” Gutshow said. “Bowhunting as a sport has undoubtedly benefitted greatly as a result of Chuck’s writings and promotion of bowhunting, especially his promotion of the compound bow. Chuck is forever tied to the growth of the sport. As the late Dave Staples, former president of the Archery Hall of Fame and Museum said, when the first Fred Bear Award was presented to Jim Dougherty in 2007, “We’ve turned a page in archery’s history with this award.